Marker at Venice and Lincoln boulevards ties wartime experience of Japanese Americans to current civil rights issues. 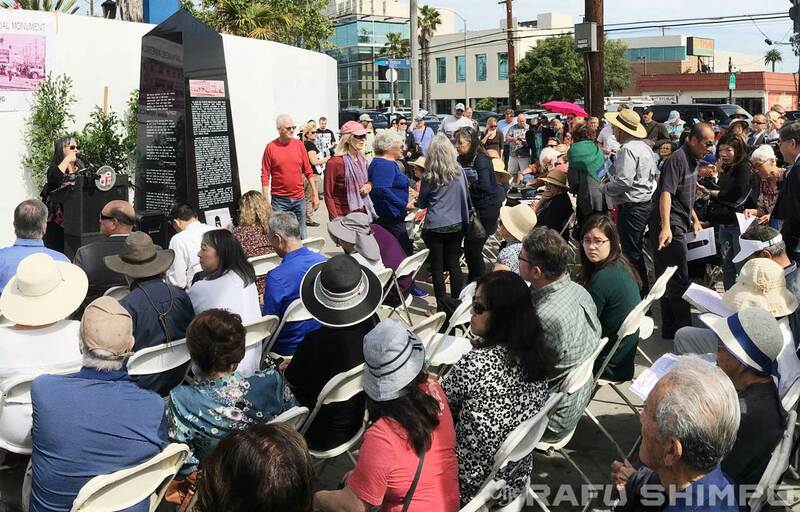 More than 200 people gathered on a pleasant Thursday morning at the northwest corner of the busy crossroads of Venice and Lincoln boulevards to dedicate a 6.25-ton monument erected to commemorate another April day some 75 years earlier. On that day, more than 1,000 local denizens, many dressed in their Sunday best and bearing what possessions they could fit in a suitcase, boarded buses to begin an odyssey that would deliver them first to horse stables and then to where most would spend the next several years: a concentration camp on U.S. soil. Those 1,000 people came from Venice, Santa Monica and Malibu, and were singled out because of their Japanese ancestry, whether legal resident aliens barred by law from naturalization or American-born citizens. The obelisk was installed the previous Saturday. 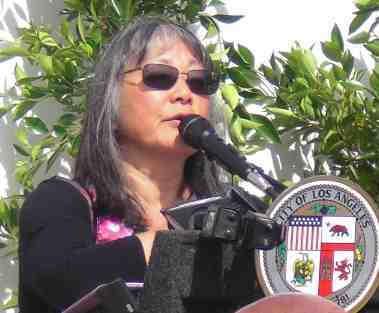 In response to a query, Hayashibara noted that the corner was well-lit at night, but that the committee still wants to apply with the Los Angeles Department of Water and Power for the installation of a light that shines directly on the monument, with possible discussions to come about a security video camera. Her concerns about the monument were foreshadowed in remarks by keynote speaker Warren Furutani, who predicted that it would desecrated. Alluding to axe marks and shotgun damage to a metal plaque at the site of the former Manzanar War Relocation Authority Center, the former California assemblyman and co-founder of the Manzanar Committee said, “In a few days, weeks, months — maybe it’ll take years and I know the Venice community will be very vigilant but — this marker will be defaced. Later, as one of the ceremony’s speakers, VJAMM committee member Suzanne Thompson responded to Furutani’s statement, first acknowledging that the Venice arts community has had an ongoing problem with graffiti on public art and monuments. 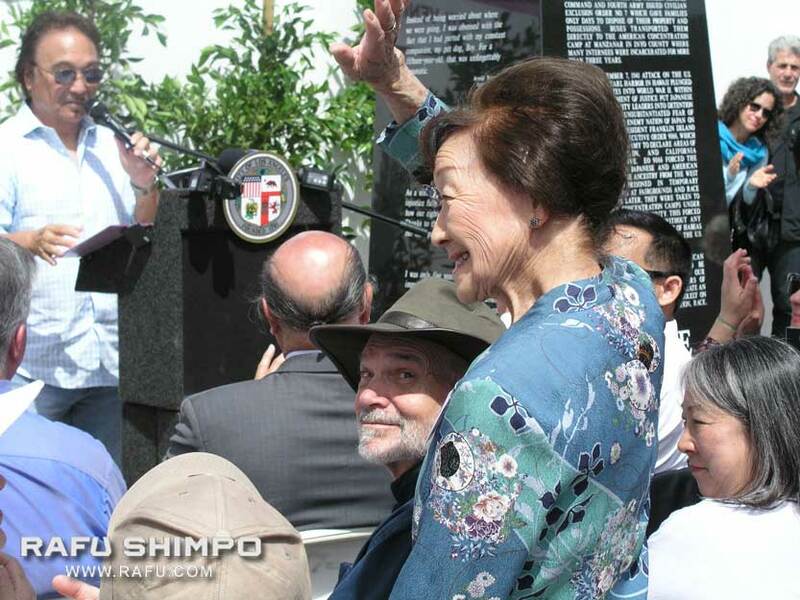 Another of the speakers was VJAMM committee member Brian Maeda, who introduced the other former incarcerees present at the ceremony who, along with himself, have quotations inscribed on one side of the monument. “We’re different today,” he said of the outpouring of political support for the monument contrasted with 1942. He also marveled at how the concept for the monument, which he called “beautiful,” had evolved from a relatively small marker to the massive stone now in place. He also noted how his experiences as an infant born at Manzanar contrasted with that of his brother, Arnold Maeda, who also has a quotation on the monument. Noting that he is 19 years younger than Arnold Maeda, Brian Maeda said that his brother, the senior class president of Manzanar High School Class of 1944, only started to open up about his experiences after President Ronald Reagan signed the Civil Liberties Act of 1988. Regarding the experiences of Japanese Americans on the West Coast during World War II, he said, “My issues with it were that I didn’t know anything, that they really didn’t teach anything about it in junior high, high school or college. I had to learn about it on my own. They didn’t have Asian American studies at that time at UCLA. I was always ashamed that I had been born in this place. Why this place, out in the middle of nowhere? Also quoted on the monument are May Kageyama Kakehashi, Amy Takahashi Ioki, and the late Yoshinori Tomita, who passed away in January at the age of 80. Other speakers included Jim Smith, Venice Peace and Freedom Party; Ruth Galanter, former member, L.A. City Council; Joel Jacinto, Los Angeles Public Works Department board member; Zev Yaroslavsky, former Los Angeles County supervisor; Rachel Zaiden, senior field deputy for Supervisor Sheila Kuehl; Len Nguyen, senior field deputy for Los Angeles City Councilmember Mike Bonin; Kevin McKeown, Santa Monica city councilmember and former mayor; Jeff Burton, National Park Service; Dr. Jimmy Hara; and Dr. Thomas Yoshikawa. 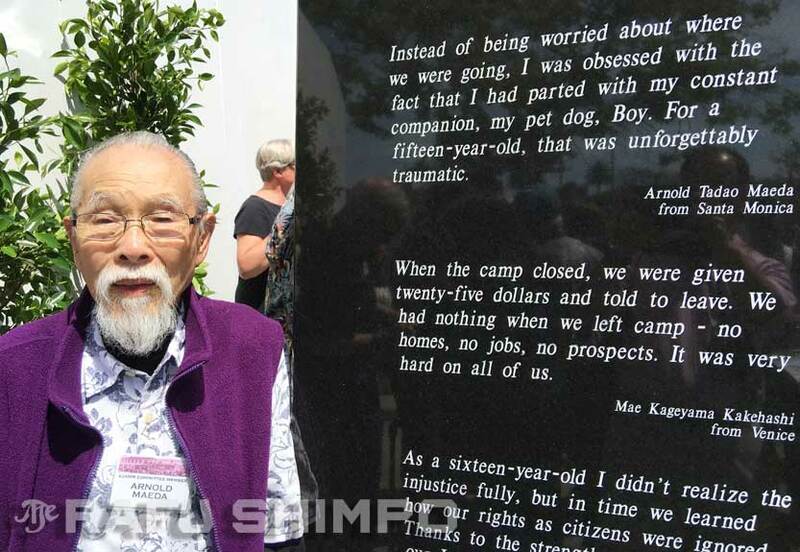 Arnold Maeda, next to the his quotation engraved on the monument. history to be sanitized, ignoring the shameful parts of it. On a trip to Washington D.C. I visited the JANM. It was being used as a skateboard park by local children but they respectfully left when my brother and I visited. It had no defacements, but we were the only visitors around.